Click images for expanded view. Test was performed by U.S. Military Personnel during evaluation of the Nitro-Pen and other detectors available in ChemSee’s Detection Kits for Explosives and Explosive Precursors. * Green / purple color indicates the presence of TNT. Test was performed by U.S. Military Personnel. 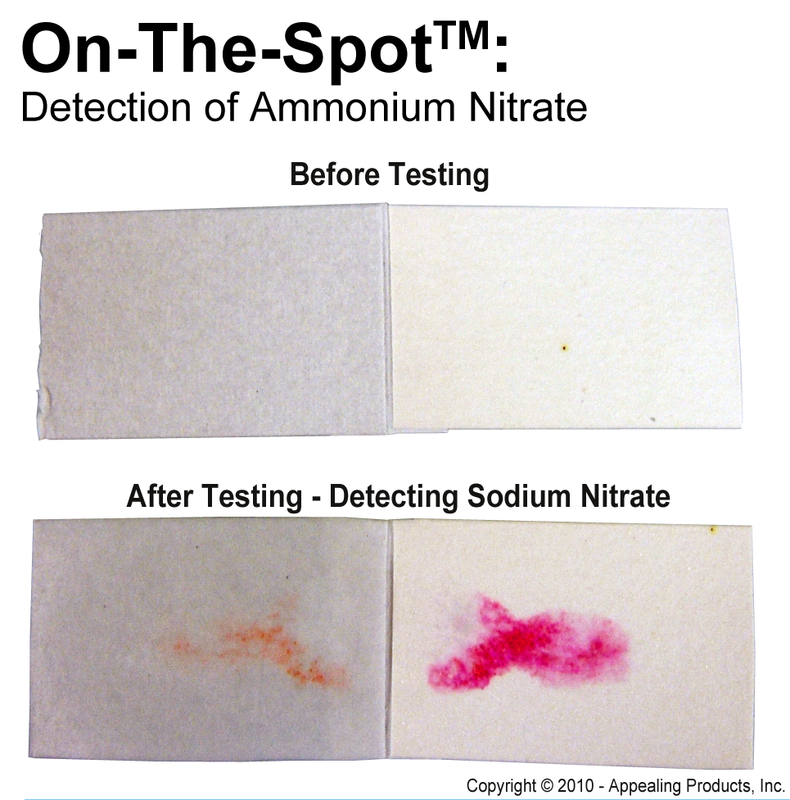 * Pink / purple color indicates the presence of Ammonium Nitrate. * Pink / purple color indicates the presence of RDX & other Nitramines. Test was performed in ChemSee / Appealing Products, Inc.’s laboratory. * The Pink color formation on Side B of the detector indicates that inorganic nitrates are present. * Red bands indicate detection of acetone and mineral spirits. Black band indicates detection of peroxide. * Red band indicates detection of mineral spirits. Test was performed in ChemSee / Appealing Products, Inc.’s laboratory. Note that the indicator strip is stable when exposed to Sulfuric Acid. * Yellow color formation indicates a strong acid (e.g. Sulfuric Acid) is present.